Manikarnika Ghat is the most famous ghat in Varanasi and it is associated with earrings of Shiva and Goddess Parvati. Manikarnika Ghat is also known as the burning ghat as corpses are burned here. Cremations are conducted at all time of the day and night here. It is believed in Hinduism that those who get cremated at the Manikarnika Ghat will escape from the cycle of birth and death. 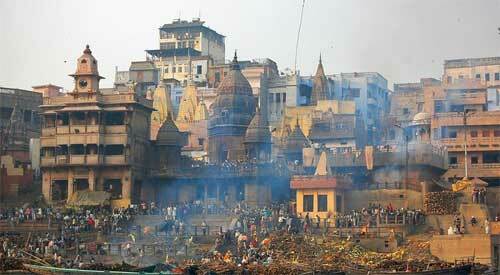 Why Corpses Are Burned At Manikarnika Ghat? It is widely believed that by getting cremated on the Manikarnika Ghat, one will escape from the cycle of birth and death. As per Matsya Purana, those who are cremated here will attain moksha. Legend has it that Lord Vishnu dug a pit here with his chakra to fill his perspiration created by intense austerities performed. The pit can be still found here. People sprinkle water from this pit on their head and body as an act of purification. Another legend has it that an earring Manikarnika of Shiva fell into the pit and hence the name Manikarnika Ghat. Another legend has it that Goddess Parvati was fed up with the wandering habit of Lord Shiva. In order to keep her husband in Kashi she hid her earrings in Manikarnika Ghat and told Shiva that she lost them on the banks of Ganga. Shiva continues to search for it. It is said that whenever a cremation takes place here, Lord Shiva asks the soul whether it has seen Goddess Parvati’s earrings.